Positive Thoughts started out as Malvern MIND back in 1978. Ken and Zella Shawyer were the main driving forces in setting up the organisation - they felt that there should be more help and support for people suffering with mental health problems. Together with groups at Droitwich, Evesham and Pershore, Redditch, Bromsgrove, Worcester city and Wyre Forest, Malvern MIND was part of the Worcestershire MIND Association. The first project in Malvern was a Sunday afternoon drop-in to enable people with mental health problems to meet up and have a cup of tea and chat with volunteers who understood about mental illness. his drop-in was held at the Social Education Centre off Geraldine Road and transport within Malvern was provided for 40p return. A self-help group was started after MIND organised an eight week course on relaxation. This was so successful that a small group of people decided to meet each week in each other’s homes to listen to a relaxation tape/CD and discuss their problems in a positive way. This group continued to meet weekly over many years. Public meetings were also held from time to time in which mental health professionals were invited to give talks on subjects relevant to mental health. A Wednesday drop-in was also established, which ran for many years on Wednesday mornings at the Lyttleton Rooms, Church Street. In 2010, Malvern MIND disaffiliated from the national MIND organisation and became the independent charity Positive Thoughts. Positive Thoughts continues with the aims and objectives of Malvern MIND and now runs a weekly drop-in service on Friday afternoons at The Cube on Albert Road North. 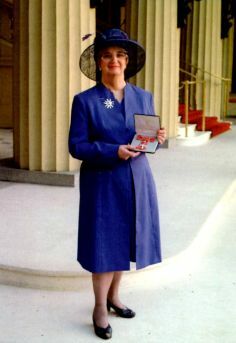 In 2002, Zella received an MBE for services to charity - here she is at Buckingham Palace accepting her award.